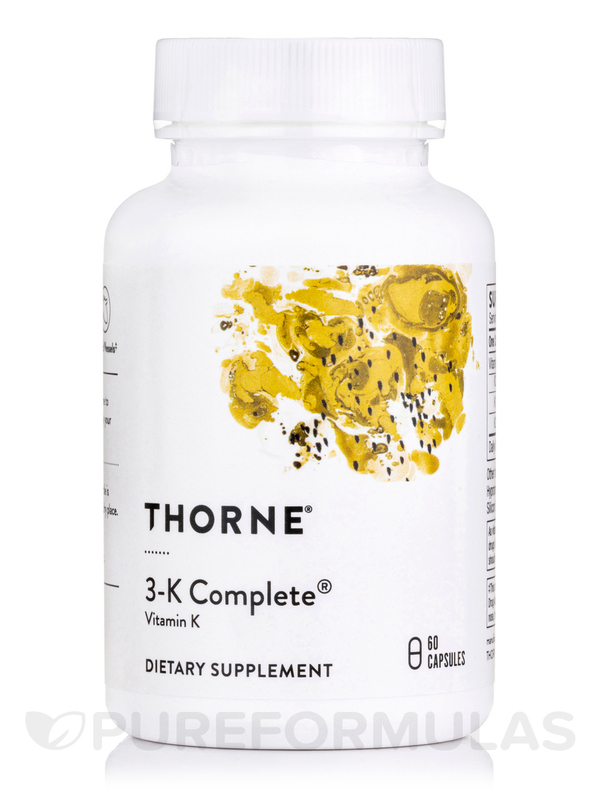 3-K Complete contains three clinically studied forms of vitamin K – vitamin K1‚ and two forms of vitamin K2 (MK-4 and MK-7). 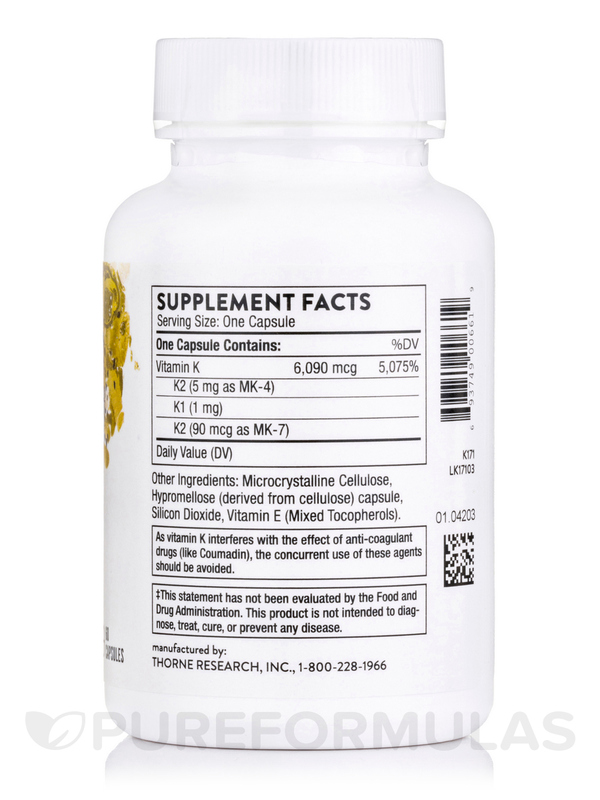 It contains significantly more MK-4 than most other multiple-K products on the market. Many people think of vitamin K as the vitamin that supports the normal and healthy ability of the blood to clot. But vitamin K also supports strong bones and healthy arteries. Vitamin K "pairs up" with vitamin D in the body‚ much like magnesium pairs up with calcium. The result is that vitamin K and magnesium can both help keep calcium in the bones and out of the blood vessels and other soft tissues. 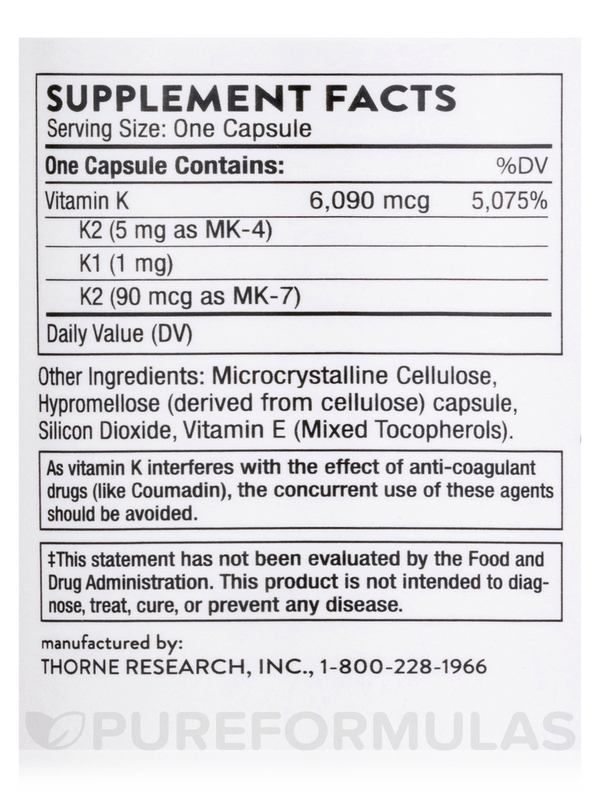 3-K Complete includes the clinically studied forms of vitamin K1 and vitamin K2 (as MK-4 and MK-7). 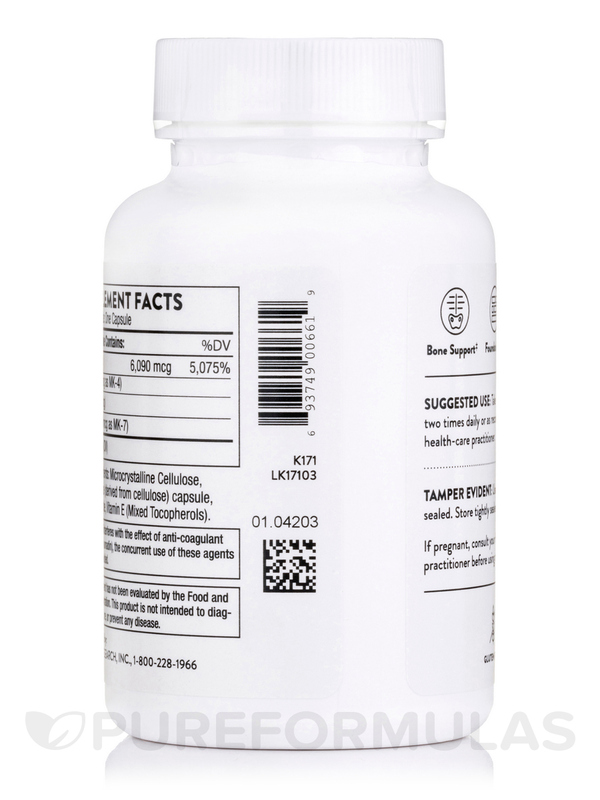 3-K Complete contains significantly more MK-4 than most other multiple-K products on the market‚ while the MK-7 is MenaQ7® – used in the majority of MK-7 research. The body's activation of important proteins – via a process known as carboxylation – appears to be at the center of most of vitamin K's therapeutic benefits. When vitamin K is present as a co-factor‚ the proteins activated in this vitamin K-dependent carboxylation process include multiple blood-clotting proteins (prothrombin and others)‚ bone mineralization proteins (osteocalcin and calbindin)‚ and the vascular calcification inhibitor protein (matrix Gla-protein). 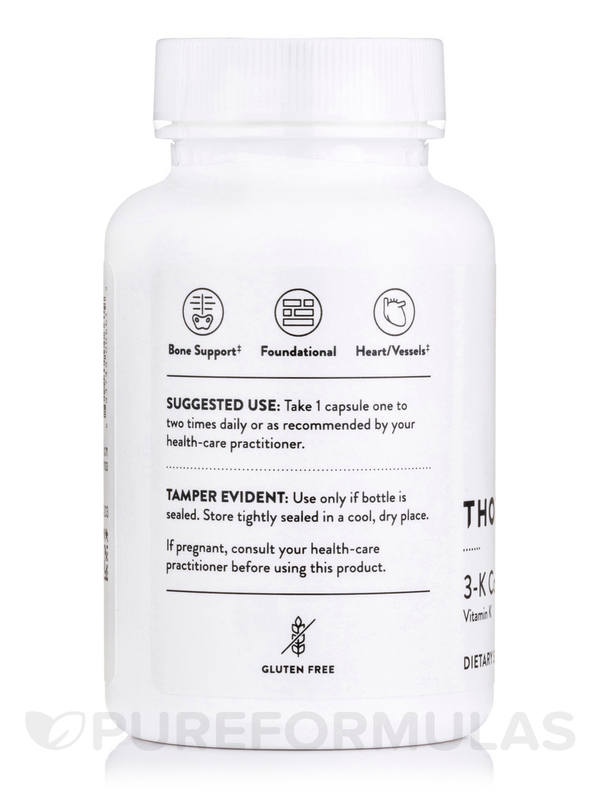 3-K Complete offers support for bone‚ cardiovascular‚ and metabolic health. It also offers nutritional support for oncology patients. Other Ingredients: Microcrystalline cellulose‚ hypromellose (derived from cellulose) capsule‚ silicon dioxide‚ Vitamin E (mixed tocopherols). 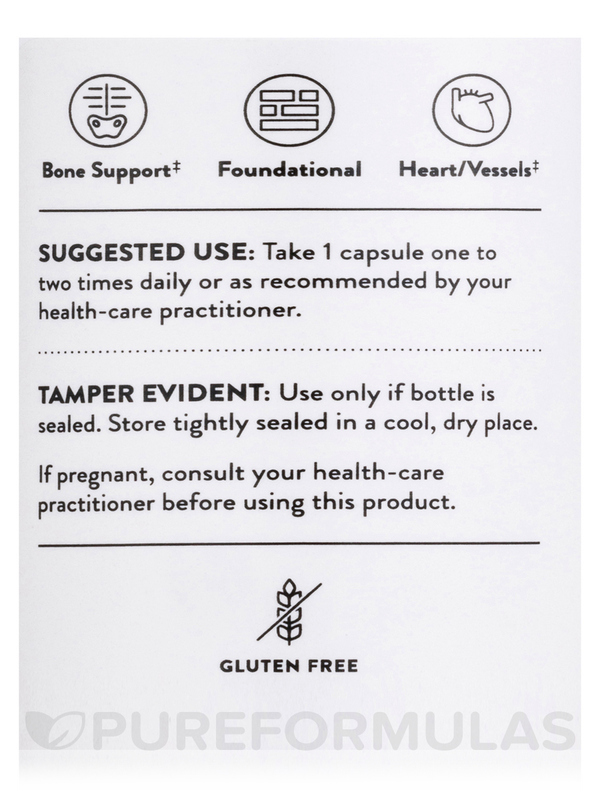 Take 1 capsule one to two times daily or as recommended by your healthcare practitioner. As Vitamin K interferes with the effect of anticoagulant drugs (like Coumadin)‚ the concurrent use of these agents should be avoided. I took this in consistent/high doses to heal a tooth that was at risk for root canal treatment after dental work. I cannot determine if the trauma resolved from taking this, or the other homeopathic remedies, but I believe that it helped and I am continuing with it for other teeth. Also, gluten intolerant and I had no reaction to this product. 3-K Complete by Thorne Research is the best K I have found. Vitacost recently stopped carrying it, so I looked for another company. PureFormulas carries all the best brands of supplements, and with the point system, I save $'s. Maybe it's time for a change! Thorne makes high quality, clean supplements. I am celiac and so can tolerate only allergen free brands. Thorne's Complete K had the most 'complete' formula I found. I used a number of Thorne products because they are clean, quality products.